At long last Cambridge University Press have released a paperback version of our book 'Agricultural Extension and Rural Development'. Those of you who already know the work might realise that in this version the sub-title has been slightly altered - it now reads as 'Breaking out of Knowledge Transfer Traditions'. The book is now available PB ISBN:052103941X at £23.99 or US$45.00. The original hard cover edition of Ison and Russell was released in 2000 and although not widely reviewed, those that did appear usually offered critical engagement with the ideas of the book - in the main they were positive. Some reviewers missed the point entirely! Some of the reviews are reproduced below. 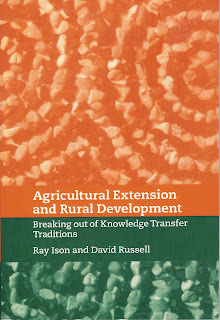 Agricultural Extension and Rural Development: Breaking out of Traditions, eds R. Ison & D. Russell. xii.239 pp. Cambridge: Cambridge University Press. £35.00 or $59.95 (hardback). ISBN 9 780521642019. At the recent International Rangeland Congress (July 1999, Townsville), participants came to the sobering conclusion that the ` best practice ' recommendations of scientists over the last 30 years had performed no better and often worse against a range of objective measures, than ` top' pastoralists' practice in maintaining range productivity, ecological function and profitability. The contributors to this book provide theoretical and methodological insight into why this might be so, as well as how research and extension professionals, together with industry stakeholders, from producers through to processors and marketeers, might choose in the future to go about the business of knowledge development and shared learning in a different way. They illustrate their case by reference to their interaction over a number of years with sheep producers and the wool industry in the semi-arid Western Division of New South Wales (NSW), Australia. But the implications have far wider application and are in fact consonant with what is emerging as the leading edge of thinking and practice wherever research funding, research management and extension aim to sustain farming and rural communities in ways which are both environmentally safe as well as profitable. The book introduces a number of key concepts, presented initially in Part I but elaborated and illustrated at numerous points throughout. An important opening concept is that of multiple traditions of understanding. It draws attention to the way that science works within intellectual traditions that serve both to offer new perspectives through the doors that are opened but also to constrain perception and understanding by the doors that remain closed. Pastoral science has proceeded on the basis of traditions which have obscured as much as illuminated, not least because of the tendency to avoid recognition that multiple traditions do exist and, moreover, that pastoral producers themselves work within their own traditions of knowledge and learning. The authors recognize, as scientists, that what they call first order change, that is, change within existing traditions of understanding and practice, is both useful and necessary. But they argue for complementary commitment to second order change, that is, systemic change which brings about change in the structure of traditions. The varying, sometimes contradictory, traditions of understanding that have guided policy, research and extension in the Western Division of NSW since nineteenth century settlement began are elaborated in Part II, together with an analytic report of semi-structured interviews with extensionists, middle managers and senior executives in R&D organizations with a stake in the Western Division. The SSIs suggest, as other research elsewhere has done, that explanations of experience are explained in terms of experience, and that ` the generated experience always remains secondary to the world of daily living ' (p. 157). In plain words, the ways we understand the world are coloured by the world we experience; the structures within which we work matter. Ison, Russell and Fell in Part I thus argue that, theoretically, second order change requires attention to the biology of cognition and here they draw largely on the work of two Chilean neurobiologists, Humberto Maturana and Francisco Varela. A foundation concept is that it is impossible for biological organisms to directly apprehend the world (the mind is informationally closed). People are structurally coupled to their environment via triggered response mechanisms. The coupled structure coevolves as people determine the world they experience. Each person's perceptions of the world they experience is unique: we can have an experience in common but literally cannot share a common experience. Adaptive learning, and the articulation and sharing of learning through languaging, thus bring forth a world (rather than reveal, as the tradition of normal science would have it, the nature of the world). Perception at a distance (through technology or theory) mediates and extends the networks of shared learning. This opens the way to understanding how stakeholders can be invited to cocreate future worlds by engaging together in systematic knowledge generation and shared learning processes to bring about second order change. A key notion here is that of enthusiasm, which the authors use as an organizing principle for how they approach their work as researchers and extensionists, as well as to describe what they aspire to recognize and support among the wool growers in the co-researching process. Intellectually in its root meaning it draws attention to the possibility of understanding being generated from within. Emotion- ally it signals the inner motivation that gives energy and direction to identifying and achieving what it is we want to do. Methodologically, it moves the research process toward narrative, conversations that allow someone to tell their story rather than impart ` facts ', stories that convey meanings, share interpretations, reveal enthusiasms. Common enthusiasms then form the basis of working together in more focused research and action (which may indeed involve some first order science). The reader is taken in Part III through the history of a research project which aspired to bring into being the concepts outlined above, whilst as yet the researchers themselves had scant experience in how to act or guide such a process. Mistakes are honestly reported as well as the delights and excitements that arose as the process began to generate the energy, commitment, and systemic effects anticipated by theory. The first-person views and experiences of some of the wool growers are presented in chapter 8 and largely confirm, in the view of the producers themselves, the importance of the complementary role of the new way of ` doing research', ` extension', and ` development' in helping families, communities, and indeed whole industries, to learn how to survive in a fast-changing world. Part IV attempts to systematize the experiences recorded in the book, to provide guidelines for designing R&D systems which can bring different, often initially antagonistic stakeholders, into concerted action for mutual benefit. The proposed process design avoids the trap of assuming there must be consensus in terms of values or understanding; what is needed, rather, is appreciation of difference and the development of a common statement of the purposes for which action should be taken. By making the procedures explicit the authors aspire to advance practice by creating the possibility for critical appraisal, or openness to public scrutiny. Without such transparency, R&D is likely to remain locked in traditions which fail to meet the needs of societies which are faced with the necessity of rapid change, but which lack procedures for generating shared understanding as the basis for effective action. This book represents in many ways work in progress at the leading edge of what is emerging as ` best practice ' in agricultural R&D. It presents concepts that will be unfamiliar to many readers, sometimes in a difficult prose style (perhaps evidence of the acts of languaging that must take place as new understanding emerges). But it is highly recommended for students, practitioners and R&D managers everywhere +/- and not least to science professors within agricultural universities who do not yet see how their experience of the world within university structures is blocking the generation of the very understanding we may need to survive. Ison R & Russell D (eds). 2000. 239pp. ISBN 0521642019. Cambridge University Press. Price: GBP 37.50. What a book! It shows that the assumptions about and approach to agricultural research and development that have been exported from ‘developed’ countries are now being strongly challenged even there. In a research project in western New South Wales in Australia, where sheep are kept on arid rangeland, it was realised that the conventional transfer-of-technology approach to extension is not working. Detailed research revealed that a major reason for this is the lack of communication between farmers (‘graziers’ or ‘wool producers’) and various government and private services. Action research was carried out primarily through discussions, meetings and visits (to wool mills, the wool marketing board, etc). A chapter entitled ‘The graziers’ story’ gives the producers’ assessments of the research process and outcome. It does this not according to any fixed format or specific indicators, but by presenting subjective and fascinating accounts. The main thrust of the book is to encourage reflection on approaches to research and development. A distinction is made between ‘first-order processes’ in research, in which the scientists are outside the system they are observing and analysing, and ‘second-order processes’, in which the scientists are active partners in a development process. It is also stressed that the choice of research subject and approach cannot be divorced from the personal histories of the scientists involved. because the state and its various services want to exert power over the resources and resource users. The book offers some very stimulating reading on interactions between different stakeholders that by overcoming barriers to communication have resulted in developing new knowledge. However, a point of criticism is the high price, which unfortunately puts the book out of the reach of most potential readers. Hopefully the price of the paperback version will make it more accessible to potential readers!